Yankee Doodle Dandy brings images of ponies and patriotic spirit, beauty of country and the good people in it. 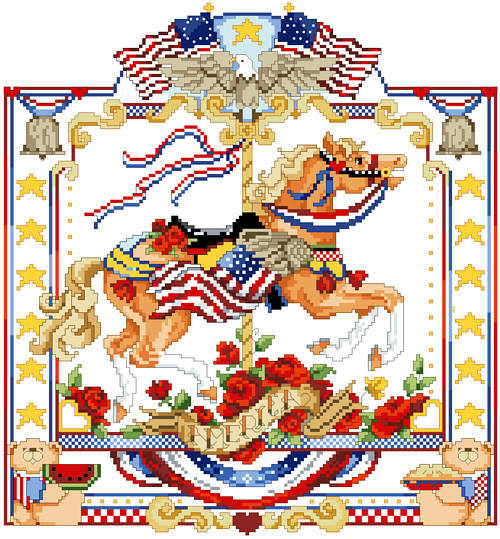 This design pays tribute to the USA with its Carousel horse and teddies, red white and blues, apple pie and watermelon with roses and flags honoring all who serve. 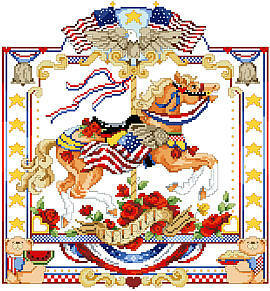 This bright and beautiful Counted Cross Stitch chart pak is full of imagery and designed by Linda Gillum. Contents: Stitch Count 153w X 165h, Finished Size on 14-ct 11" X 11-3/4"